A 44 year old woman presented with a 12 month history of abdominal distention, bloating, pelvic pain and urinary frequency. She had noted menstruation had become heavier. Pelvic USS revealed a large multi-fibroid uterus. She subsequently had a Total Laparoscopic Hysterectomy. The uterus weighed 750g. 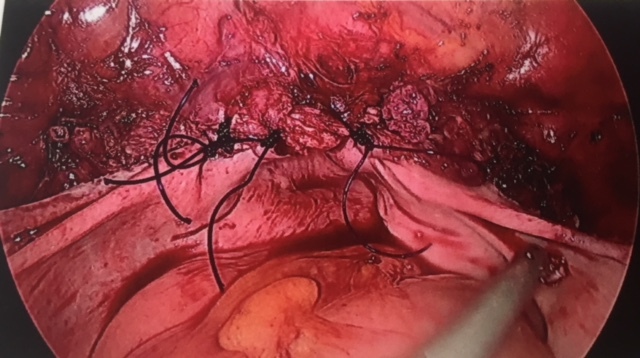 The laparoscopic view of the large fibroid uterus. The right broad ligament pedicle is divided. The right ovary is preserved. The left broad ligament pedicle is divided. The left ovary is preserved. The vaginal vault at the end of the procedure. Both ovaries remain but cannot be seen in this image.